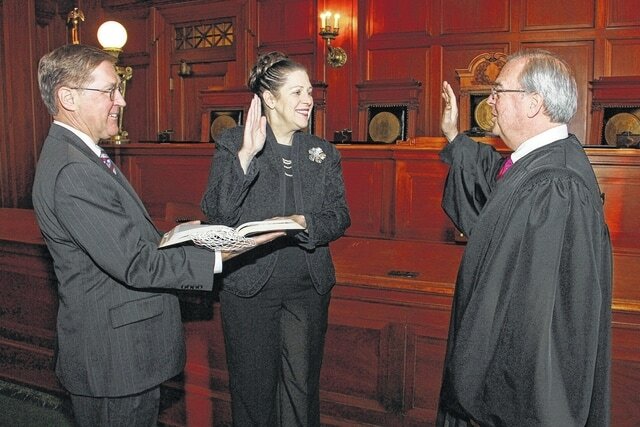 Pictured from left to right, Chief Administrative Law Judge Robert Swisher, Administrative Law Judge Tanya Pullin and Kentucky Supreme Court Chief Justice John Minton administering the oath of office in the Supreme Court Chambers in the State Capitol in Frankfort. On Tuesday, former Kentucky 98th District State Representative Tanya Pullin was sworn into office as an administrative law judge. To get to that point, Pullin had to resign as state representative. Because the House of Representatives seat was vacated a special election will be held on March 8, officials said. The voters of Greenup and Boys counties will elect a representative for the open seat. On March 8th, four special elections will take place throughout the state to fill four open House of Representatives seats. Open seats due to resignations are House District 8, 98, 54 and 62. Several people within Greenup and Boyd counties have expressed possible interest in seeking the seat. When asked what she will miss the most about being state representative, Pullin said she would miss the people of the district the most. As an Administrative Law Judge Pullin will preside over hearings about specific cases mostly workers compensation.